We’ve decided to let you in on a little secret. A secret known only to skimo racers, parapalegics, high-school physics teachers and the rare students who retain knowledge after the test. The secret is a simple machine known as the Inclined Plane, shown below. It should now be clear why guys and gals in skin suits prefer lower angle tracks. 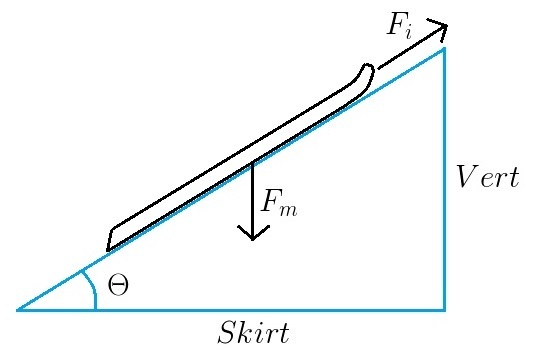 The lower the Vert-to-Skirt ratio, the greater the mechanical advantage. Those wise old tight-wearers are using an Inclined Plane to cheat the game of life. This is the simple but eye-opening secret. Disclaimer time: the above formulas represent a frictionless inclined plane. The force to pull a ski along the plane (Fi) increases as friction increases. With certain nylon skins at certain slope angles, the mechanical advantage of the inclined plane might be entirely negated. This possibly explains why some folks naturally stomp up the mountain instead of slide. If you have skins with decent glide, or even optimize for that quality, you can really use the slope of the mountain to your advantage. It can take time to train your muscles to perform a sliding motion instead of a stepping motion, but the results are longer, more enjoyable days. - We prove the little extra weight of the NWP is nothing compared to the comfort given by the Natural Stride and the better grip of the skins on any kind of slope (especially when is very steep). NWP-Race will assure a faster start and faster walking with zero back/feet pain problems. Try to believe ! 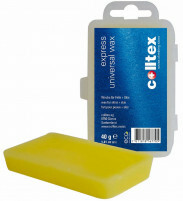 and ask to Skimo Co for our products !